Women have incredible potential to drive change in education if they step up to lead at all levels. 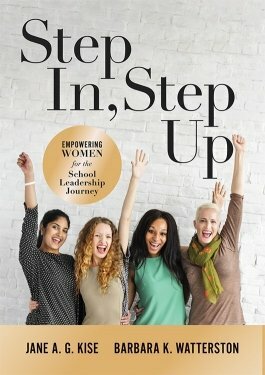 In Step In, Step Up, authors Jane A. G. Kise and Barbara K. Watterston guide current and aspiring women leaders through a twelve-week leadership journey. An assortment of activities, reflection prompts, and stories empower readers to overcome gender barriers to female leadership and engage in opportunities to learn, grow, and lead within their school communities. Examine the need for women in leadership positions at schools and districts. Consider your own leadership identity and learn where to make adjustments. Feel empowered to overcome gender barriers, female stereotypes, and the double bind experienced by women in leadership roles. Gain tools and strategies for creating an action plan for effective instructional leadership in schools. Learn about hard and soft leadership skills and their value in educational leadership. Complete reflection activities to reinforce learning and professional leadership development.